Assemble a team of the world's most dangerous, incarcerated Super Villains, provide them with the most powerful arsenal at the government's disposal, and send them off on a mission to defeat an enigmatic, insuperable entity. Psycho meets plastic with this Suicide Squad Shirtless Joker 3 3/4-Inch Action Figure! From the film Suicide Squad, Joker is featured in his long pants, purple gloved hand, and tattooed chest. 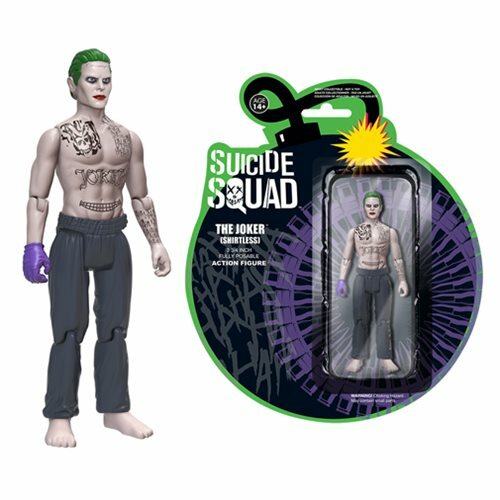 The Suicide Squad Shirtless Joker 3 3/4-Inch Action Figure is a fully posable figure with approximately 8 points of articulation and comes in a stylized Suicide Squad-themed blister card package. Ages 14 and up.